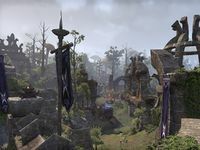 Ularradallaku (or simply called Ularra)[UOL 1] is a Daedric ruin located on the island district of Vvardenfell, situated in the province of Morrowind. In its time, Ularradallaku was a temple dedicated to Mehrunes Dagon, the Daedric Prince of Revolution and Destruction. It has since been ruined, covered in overgrown plants. During the Interregnum circa 2E 583, Ularradallaku's ruins were used by the Circle of Champions, a guild consisting of the greatest gladiators and fighters found all throughout Tamriel. Ularra was one of the three battlegrounds used by the Circle, including Ald Carac and a quarry around Foyada Mamaea. 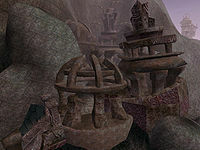 Years later in 3E 427, the Circle of Champions had long abandoned the ruins, and so it was reclaimed by the elements, and the usual worshippers of Mehrunes Dagon. One such worshipper, Inganar, was one of the wielders of the Threads of the Webspinner, specifically the Glove of Sanguine Safekeeping. The glove was retrieved by an agent of the Morag Tong. This page was last modified on 28 November 2018, at 17:50.